There was a heat wave this summer (2018) in England and Europe and during my recent trip to The Netherlands, I had lunch in the sunny garden of my friend’s older sister. One of the dishes was a pasta salad and included an ingredient which you would find as a garnish in many Polish dishes – skwarki – small, crispy, fried, bacon pieces. This was a wonderful addition and I think would go well in other salads too. I recreated this dish when I got home – the exact amounts are not so important. Chop the bacon into small squares and place on a heavy frying pan on a medium heat until all the fat comes out and you are left with small, crispy squares. Drain the bacon pieces from the fat and place them on some kitchen roll and leave them until they are cold. Chop the celery into fine pieces. You can cut the pasta into smaller pieces if you wish. In a large bowl, mix the pasta, sweetcorn, celery and the skwarki together. Add the mayonnaise and the ground black pepper and mix well together. You are unlikely to need to add any salt as this is provided by the bacon. This salad will go well with cold meats and barbecued meats. Today, 4 July 2016, is the first Anniversary of my blog! What an interesting year it has been for me with all the reading & research, cooking & photographing and the writing. I do hope you are all enjoying reading my posts & God willing this is the start of another interesting year. This will be my 58th post & I am going to write about a very popular vegetable in Poland. The word seler in Polish is used for both celeriac and celery and in fact celeriac is a just a variety of celery (Apium graveolens). Celeriac is mentioned in Homer’s Odyssey where it is called selinon. Now for a little plant biology – in English the stems of the plant are known as celery and they are long with leaves at the top. Celeriac has not been around in the shops in England for that long and last week I bought one in Marks & Spencer’s and it had a label on it saying “NEW“. Years ago when I looked at my Polish cookery book and it talked about grating seler – celery I used to think “oh, how very odd – I wonder how that comes out“ – I now realise that they were referring to grating celeriac. In Poland you are much more likely to be served celeriac than celery and it is a very popular vegetable which can be eaten both raw and cooked and is used in a variety of salads. I have been trying out some salads both with raw & cooked celeriac including some old favourites. Celeriac has a delicate flavour and easily picks up the flavours of the other ingredients. I have given details of the dressing I have used in the following recipes but they are easily interchangeable. For the following recipes you will need to peel the celeriac – use a peeler if you can as using a knife can take too much off. You then need to grate the celeriac. Lemon juice is needed to prevent the grated celeriac discolouring. Make the dressing by mixing mayonnaise and soured cream together, I tend to use equal amounts. Mix the grated celeriac & grated apple together. Pour the lemon juice over them. Add the dressing bit by bit – you want to coat the ingredients but not have lots of excess dressing. Make the dressing by mixing mayonnaise and soured cream together – equal amounts – and then add 1 to 2 large tablespoonfuls of horseradish sauce. Squeeze the juice from 1 orange & pour this over the raisins. Leave this for a couple of hours so that the raisins plump up. Make the dressing by mixing equal amounts of yoghurt and soured cream together and then add 1 or 2 large tablespoons of horseradish sauce. Peel & then chop the other orange and mix this with the soaked raisins. You can cook the celeriac by boiling it in water but I have found that it is much easier to steam it. If there is still any soil on the celeriac then wash this away with water first. If your celeriac is large you might want to cut it in half and just use half & use the other half for something else. Steam the celeriac – it will need at least 20 minutes. You can use a cake tester to see if it is cooked. Leave it to cool – I leave mine in the steaming pan with the lid on. Chop the celeriac into rough cubes or chunks. These cooked cubes are then the basis of many different salads. You can use the cooked celeriac in many salads instead of boiled potatoes as in the classic Polish Potato Salad with peas & carrots in mayonnaise. The potatoes in the above salad can be replaced with celeriac. 1 chopped onion – red looks good. Mix the chopped cooked celeriac and the grated apple together and some lemon juice. Add the chopped gherkin and onion. Add a couple of large tablespoons of mayonnaise and mix it all together. Add the chopped hard boiled eggs. Mix a dressing using 2 to 3 tablespoons of thick plain yoghurt and 1 or 2 tablespoons of horseradish sauces and mix the other ingredients. Leave this for around half and hour so that the flavours can mingle. If you hard boil very fresh eggs they are very difficult to peel -it is easier to use older eggs. This recipe is one I got for one of my sisters many years ago and although this is not a traditional Polish salad it has become one of my trusty recipes as it is so easy and as it is best to make it sometime ahead there is no last minute stress when making it. Chop the celery into fine slices. 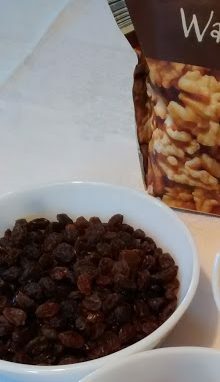 Mix with the peanut and sultanas. Add 2 or 3 tablespoons of mayonnaise. Leave for at least half an hour before serving – I usually make this several hours beforehand. Now for a little science to explain why the dressing taste so sweet and is more runny than when it started. Osmosis is the movement of water across a semi-permeable membrane from an area of high water concentration to an area of low water concentration to try to equalise the concentrations on both sides. Cells in the plant ingredients have semi-permeable membrane. 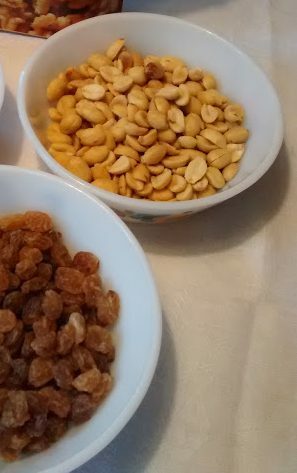 The salt on the peanuts causes water to leave the celery and go into the mayonnaise, this water then enters the sultanas causing them to plump up. The above is true when you mix many salads but especially here with the salt on the peanuts and the dried fruit.